Introducing the Draftec Deluxe Hand Pump Pressurized Cleaning Kit! 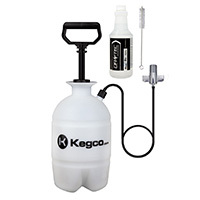 This kit saves the life of your tower without requiring you to remove the faucet - just unscrew the beer line off of the keg coupler, and screw it directly to this cleaning kit! Includes a High Pressure Hand Pump Cleaning Bottle, a 32 oz. Bottle of Draftec Advanced Draft Beer Cleaner Clear, and a Nylon Beer Faucet Brush. The 1/2 Gallon Cleaning Bottle holds plenty of cleaning solution for you to keep your draft beer lines clean. Draftec Advanced Beer Line Cleaner will clean the most stubborn draft lines. Its proprietary formulation was designed to attack not only the beer stone, but every element of beer line soils. Use the nylon faucet brush to keep your tap clean. Comments: Easy to use without having to remove the spiggot every time you clean the lines. Comments: I used to clean my line and tap with a powdered cleaner mixed with water via gravity between kegs. I thought it worked OK but I could see that not all the powder dissolved. I just used this product for the second time and all I can say is WOW. The first time I pumped the product through it came out looking like the lager I tap through it. There were chunks of crap in the container. This time I filled the system and left it set for 15 minutes then ran the rest of the mixture through and once again there were chunks of crap in the container. I gave it a rinse and took the tap apart even though you do not have to remove it with this system. It was spotless. I put the keg on and tapped a lager. It's like I changed brands. It was that good. A word of caution; do not get this solution on your hands like I did the first time.